Ziya Turner, a seventeen month old infant, was found dead inside her home on Brinker Street on Detroit's east side. While Brinker Street may be on the other side of the city from the Warrendale neighborhood, any time an infant dies it is a tragedy that touches everyone. As the police and medical examiner continue to investigate her death, a look at her home on Google Streetview may well offer insight into her home life and her family. This is a screen image of Ziya Turner's home on Brinker Street in Detroit. 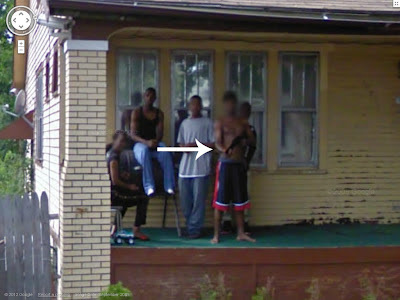 Google blurred the 4 young men and the young woman who are on the porch of this home. Regardless, one can clearly see that 1 of the young men is brandishing an assault rifle. The fact that an assault rifle was clearly in this child's home offers an insight into her family that can only be called troubling. The fact that this has been visible on the internet all this time, as yet another reminder how ineffective local law enforcement is at securing illegal firearms, can only be called disappointing or worse.